The fatal Tasmanian devil cancer has reached the marsupial's last great stronghold in the island's north-west, fuelling a dispute about the region's Tarkine wilderness. 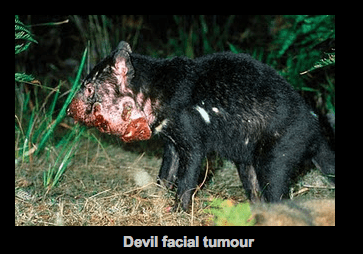 A young male trapped by wildlife researchers in plantation forests near Burnie is believed to have contracted devil facial tumour disease, adding to two earlier confirmed cases in the same area. The cancer has ravaged devils, threatening their extinction in the wild. Numbers have plunged by 84 per cent since the disease first took hold in the late 1990s, according to the Save the Tasmanian Devil Program. Scientists have seen the disease steadily sweep from east to west across the island over the past decade, to affect devils in the island's north-west, where their numbers are still healthy. Conservationist pressure is rising on the federal government to slow this incursion. The Save the Devil wildlife biologist Sam Fox said her trapping team found the latest victim, a two-year-old, in the forest district of Takone, 20 kilometres from Burnie, this week. The Takone forests being surveyed by her team are near the 447,000-hectare Tarkine, a rainforest and coastal river wilderness. Much of the Tarkine's native forest is slated to be reserved under the federal-state forests peace deal, but mineral exploration is continuing. ''There are nine open cut mine proposals and one underground,'' said the Tarkine National Coalition's spokesman, Scott Jordan. The Environment Minister, Tony Burke, said because the Tarkine was part of Tasmania where the devil was still quite healthy, a very high degree of sensitivity was felt for endangered species there. Mr Burke allowed an interim National Heritage protection order for the Tarkine to lapse after the Australian Heritage Council found it was likely to merit heritage listing. He asked the council to examine the listing further. The Tasmanian Greens MP Paul O'Halloran called on Mr Burke to explain why it was not important to put in place measures to protect the Tarkine. 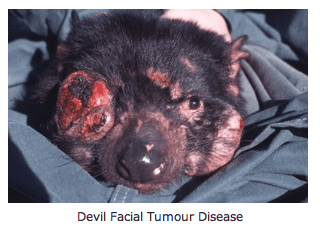 Yes, they've found a few cancer affected Tassie Devils in this area but maybe the majority are still immune. Only time will tell. But it's a good idea to really protect this area where the majority are still alright. Hate to lose another species. Why cant there be a politicians contagious facial tumour instead?? Id rather see humans die than animals! Sad. Why are we not capturing and treating if we are finding these animals! Damnit protect their home and help those that are left! Yes, so go fetch your little doggy from the upstairs bedroom and leave your family in the one next to it. Smile at your lill doggy as the house burns down and the screams of your wife and 2 children echo through the night. In other words, shut it.